The series ended in reverse of how it began. In the first episode Jack opened an eye as he regained conscious after Oceanic 815 crashed. 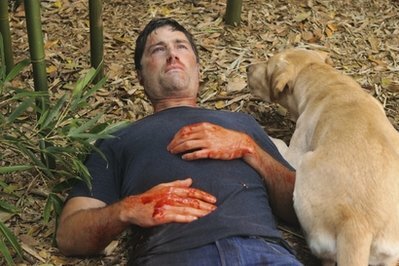 The finale ended with Jack closing his eye as he died. The series was always intended to be about Jack’s eventual death, but early on there was consideration of having this happen after only a few episodes. The series had a number of intertwined stories but it was primarily about the characters from Oceanic 815 and a handful of others who interacted with them. The story of Jacob and his brother drove the plot, but this was secondary to what happened to the main characters. Others such as Dharma and the Others had an impact but in the end they were just people who happened to be there who did not turn out to be as important as it previously appeared. [Or were some of them other candidates brought by Jacob who were corrupted by his brother?] In the end even the Charles Widmore storyline was reduced to his role being to deliver Desmond back to the island and soon afterward become an incidental casualty. The series left the fans confused and it turned out in the end that those living on the island did not really know that much either. In the second from last episode Jacob explained to Kate that having her name crossed out was just a line of chalk which did not really alter whether she could have his job if she wanted it. It remains unclear how many of the rules behind the mythology were similarly like lines of chalk lacking real meaning. When we learned the back story of Jacob and the Man in Black it did not appear that either really learned all that much about how the island worked before MIB killed their adopted mother. Rules such as that the two brothers could not kill each other, or that MIB could not kill Jacob’s candidates, were never given any explanation as to why they were binding. The rules did have loopholes as they were allowed to get others to do their killing. MIB’s motives centered around wanting to leave the island but there was never a good reason provided as to why Jacob could interact with those in the outside world but MIB could not leave. Jacob had Desmond returned to the island because his immunity to electromagnetism would allow him to turn out the light on the island. [He might have been prepared for this from the time spent in the hatch pushing the button.] The Man in Black, inhabiting Locke’s body in the finale, thought this would benefit him. Jack assumed the opposite since it was Jacob who had Desmond returned. For an epic battle to conclude the series, neither of the protagonists really knew the specifics of what they were fighting over. In the end Jack was right in trusting that Jacob knew what he was doing as turning out the light resulted in MIB losing his immortality, allowing him to be killed. Jack then died himself after returning to restore the light. Finding that the flash sideways were just a mental creation after everyone died has been somewhat frustrating. After spending the season thinking as Desmond and Juliet did we found out that any time spent trying to understand this was wasted. Early in the series there was speculation that everyone on the island was in a type of purgatory and we were reassured that this was not the case. We would have felt cheated if this was the only explanation for everything throughout the entire series. It is acceptable but still somewhat a disappointment to find that being in a type of purgatory was the explanation for the flash sideways sequences. The flash sideways sequences primarily showed a scenario with the passengers returning safely to Los Angeles with the island under the ocean. I had questioned throughout the season whether there was a contradiction between being told on the island that it would be disastrous for the entire world if the light went out but it didn’t seem to matter in the flash sideways. There were also changes in the characters beyond not being in the crash. Initially I believed that they were a consequence of the island not being present and Jacob not interfering in their lives. Now we know that the changes never occurred, but may have helped characters resolve their internal conflict. The most significant was that Jack resolved some of the father-son issues he had by having a son. While in earlier episodes it seemed difficult for characters to regain their memories of the island, it became common place in the finale, especially when characters encountered their true loves. In most cases it made sense that they were based upon relationships on the island, but I would still think that Sayid would have preferred to spend eternity with Nadia as opposed to Shannon. Regardless of my questions about this couple, the finale made clear what was apparent throughout the series that this was largely a number of love stories in an exotic location. As Christian Sheppard explained to Jack, those in the flash sideways were in a place which was outside of time in which everyone that mattered to them could be together regardless of when they died. Many of the characters died at different points during the series. Kate, Sawyer, Claire, Miles, Frank and Richard escaped in the plane and presumably died at various points in the future. Rose and Bernard probably lived out their life enjoying an island paradise. Hurley became immortal to protect the island as Jacob had and presumably lived into the far distant future before he died. Of course not everyone could join them. Even though Ben became a good number two to Hurley in protecting the island, the evil he did in his past prevented him from being one of the group in eternity. [Or perhaps he remained behind to wait for others who were the most significant people in his life.] Michael and others also remained on the island as whispers unable to pass over due to acts they committed during their lives. The finale left many questions unanswered, and not being real erased the questions about the flash sideways world too easily. While not completely satisfying, this is probably the best which could have been done to tie up all the mysteries from the past six years. The mythology of the show has lots of holes which must be accepted by faith but it did turn out to be internally consistent and to a considerable degree even make some sense. More importantly, the show must ultimately be seen as the stories of the characters who got caught up in this mythology more than a story with a fully explained set of situations. Update: I added a few additional ideas in brackets to the original post. Posted in Science Fiction, Television. Tags: Lost. RSS feed for comments on this post.. TrackBack URL. Never saw an episode – what did I miss? You missed a plane landing on an island where lots of strange things happened, along with flashbacks revealing more about the lives of the characters. Along the way the flashbacks turned into flash forwards which showed what happened after some of the characters got off the island. Some of them left the island but then returned, with some of them winding up in the past. They tried setting off a nuclear bomb which they though would destroy what was responsible for their plane crashing in the first place. Instead they wound up back in the present. The flash forwards were then replaced by the flash sideways which we thought showed an alternate reality in which it worked and the plane did not crash. In the final season we found that many of the strange things which have happened were due to a clash between immortal brothers–one (Jacob) who was protecting the island and one who was trying to destroy the island and leave it–which might mean very bad things for the outside world. We found that Jacob set things up for the plane to crash in order to bring candidates to the island who he needed to both hill his evil brother and take over as protector of the island. The plan worked and the evil brother was killed. We finally learned that the flash sideways were actually a mental creation of many of the people on the island as they got back together, regardless of when they died in our time line, to all cross over to wherever it is they go after they die together.